The Royal Hospital for Women, Randwick, is a national leader in the treatment of gynaecological cancer. 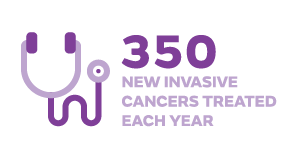 Every year, the department treats 350 new invasive cancers; performs 330 major operations and undertakes more than 1000 cycles of chemotherapy. Your donation will not only enable us to enhance our gynaecology oncology ward, which cares for 24 patients at a time. It will allow us to tackle ovarian cancer through rigorous research. Professor Neville Hacker, the Director of The Royal's Gynaecological Cancer Centre, says the holy grail of ovarian cancer research is a simple blood test that could be used as a screening test for all adult women. 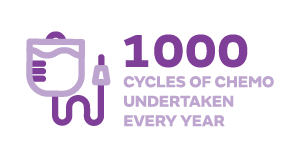 An annual check-up would mean most ovarian cancers could be detected before they had spread beyond the ovaries. Early stage ovarian cancer has a high cure rate, often with surgery alone, without need for chemotherapy. Hacker’s team has been working in partnership with research scientists at the Lowy Institute, and earlier at the Garvan Institute on the test. The Royal is also heavily involved in clinical trials of gene or targeted therapies. These therapies target a specific abnormal gene in the cancer, thus reducing the side effects of chemotherapy which destroys normal cells such as those in the bone marrow and hair follicles. In particular, Professor Michael Friedlander, the Director of Medical Oncology at The Royal, is involved in trials of a targeted therapy known as Parp inhibitors, which help patients who carry the hereditary genes for breast and ovarian cancer, BRCA1 and BRCA2. These will be a great advance in the search for a cure. Remember every donation helps, no matter how great or small.
" A modest but great achiever, whose lovely smile & kind words will always be with me"
In memory of Margaret McAleese, a wonderful supporter of Asian art. To Our Wonderful Gorgeous Friend Margaret, We miss you so much. We will continue to make wonderful creations with your beautiful fabric. With Love Always, Rhodes Fashion Sewers.